If you haven’t used sauerkraut as a salad topper yet, there’s no better time than now! It’s crunchy, it’s tangy, it takes your salad experience to a whole other level. Trust me. Plus, you’re getting a hefty dose of powerhouse probiotics with each, delicious bite! If you’ve read my Fermented Foods FAQ, then you know why fermented foods are so good for us! But, on top of the powerful health benefits they confer, fermented foods are so, damn tasty! Once you start adding fermented foods to your salads and sandwiches, you’ll wonder why you never tried it before. 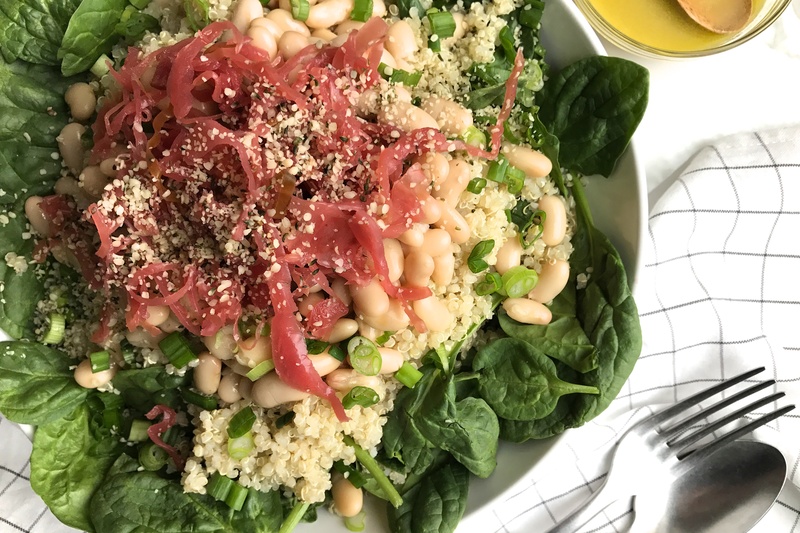 This easy, protein-packed salad really comes together once you throw the sauerkraut into the mix. 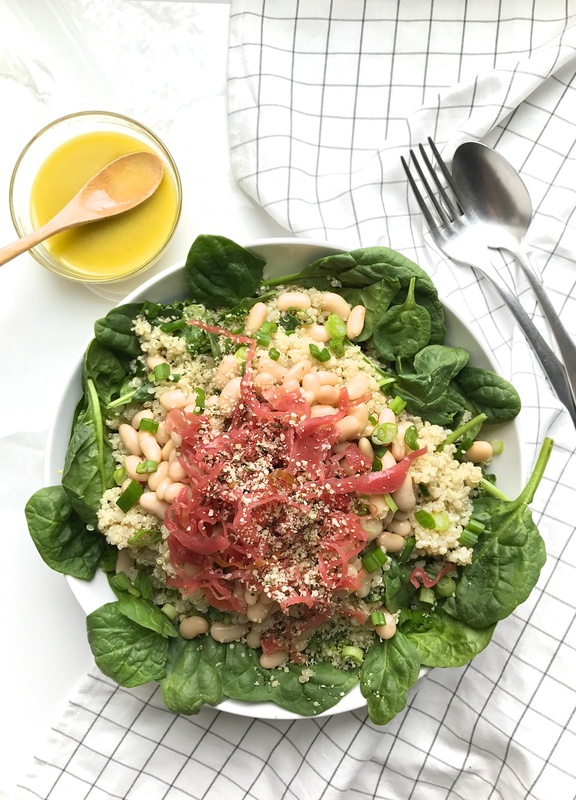 Its got plenty of plant-based protein from the beans, quinoa and hemp seeds so it’ll keep your blood sugar balanced and you’ll be satisfied until your next snack or meal. I had leftovers which I stored in the fridge and quickly heated in a pan for dinner. (Nothing better than a leftover salad fry-up!) If you need an added hit of flavour just splash a little sauerkraut juice in there too! As an optional, delicious zing, I like to throw some salty, black olives and (sometimes) crumbled goat feta too. Oh. My. Yum! You can use any colour of cabbage you want. I used red here because it’s bright and pretty, and it also has loads of nutrients. Use any dressing you like. I used a basic lemon vinaigrette this time round, but – seriously – any kind will do! Place all ingredients into a large mixing bowl, combine with about ½ cup of lemon vinaigrette and toss well. Taste and add more salt and pepper to taste. Top with hemp seeds (+ black olives and crumbled feta if desired). 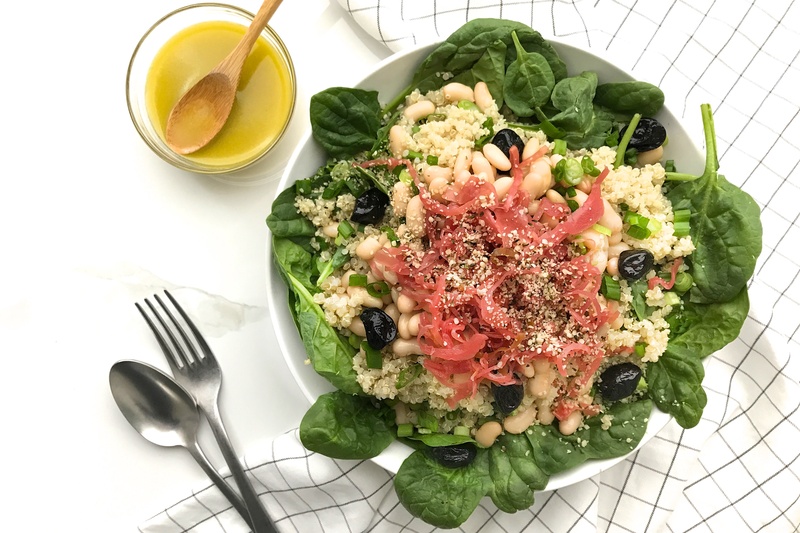 To learn more about why I never use commercial salad dressings any more and for more healthy inspiration in your own kitchen, check out my Fresh Start Kitchen ebook by clicking the pic below!